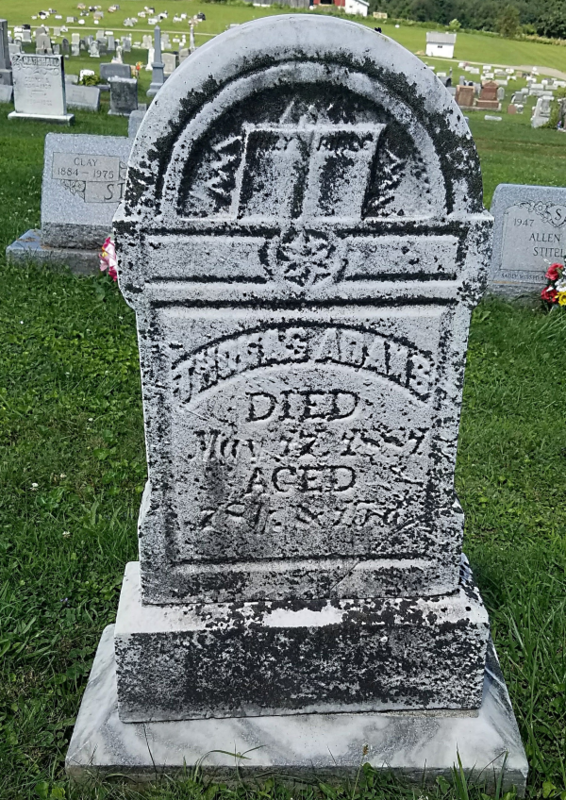 Death certificates are some of the most interesting and useful documents you’ll find when researching your ancestors and their families. 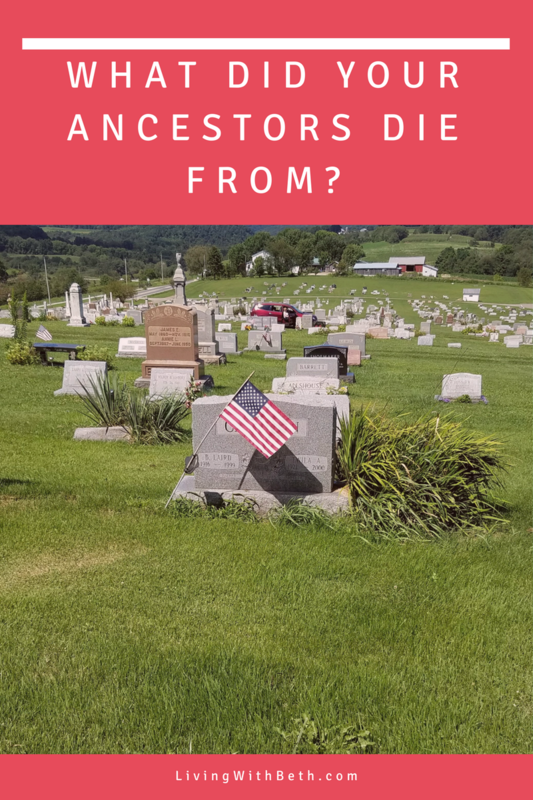 Search birth, marriage and death records on Ancestry.com , and you’ll probably find many of your relatives’ and ancestors’ death certificates from the late 19th and early 20th centuries. States varied as to when they started requiring vital records such as birth, marriage, and death certificates. Those you can find online often contain a gold mine of genealogical information. You might find names of the deceased person’s parents, including the mother’s maiden name. Death certificates include dates of birth and death as well as the cause of death. 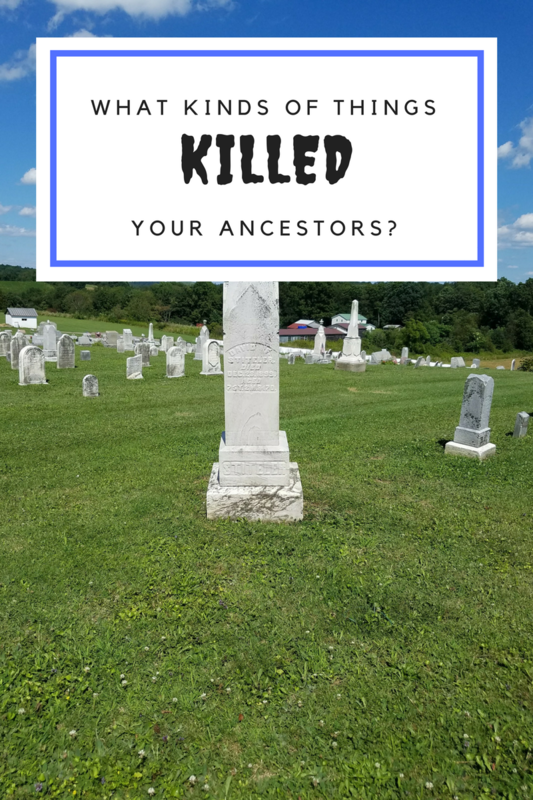 Like many other facets of genealogy research, I find causes of death fascinating. Some people died from the same ailments that kill many people in today’s world. Other unfortunate folks died from situations that rarely kill people today. 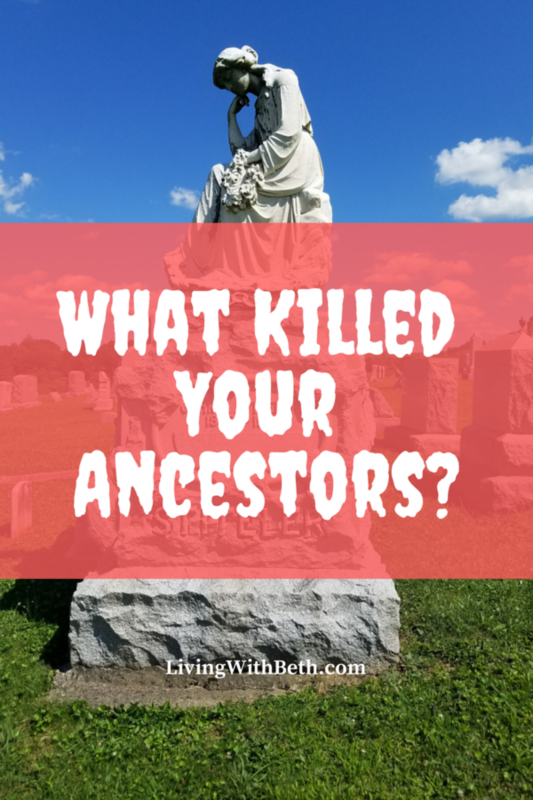 Here are some of the things that killed my ancestors and their family members. Childhood used to be a very dangerous time to be alive. Nowadays, you very rarely hear of someone losing a child. A century ago, it would be uncommon for someone with a large family to see all of their children grow to adulthood. 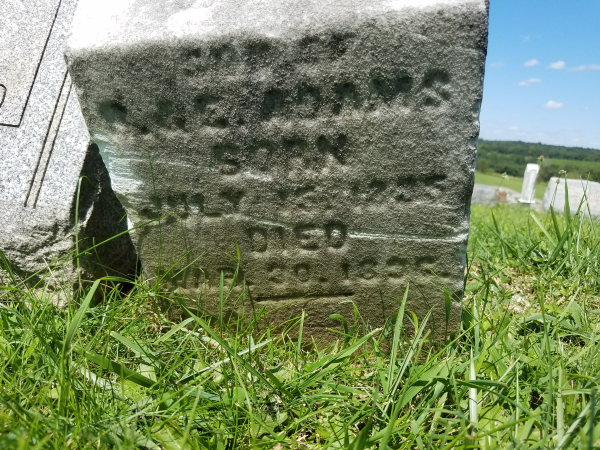 As far as I can tell, my 2x great-grandparents, the Adams family, had four children. Only one of them survived to adulthood – my great-grandmother. One of their sons died in a flash flood. I’m not sure what killed the other two. A number of different diseases could have killed them. Kids died from infections that we’d cure with antibiotics today. Children died from childhood illnesses that they wouldn’t get today due to childhood vaccinations. Children who can’t get vaccinated benefit from “herd immunity” – the vaccination of other kids making it unlikely that they catch the disease and can transmit it to others. 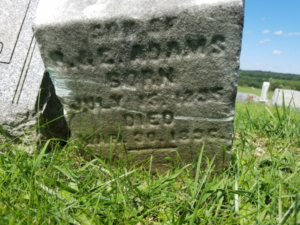 In my genealogy research, I’ve regularly found parents who lost children. One family lost all five children in a typhoid outbreak. Up until fairly recently in history, making it through childhood was quite an accomplishment. 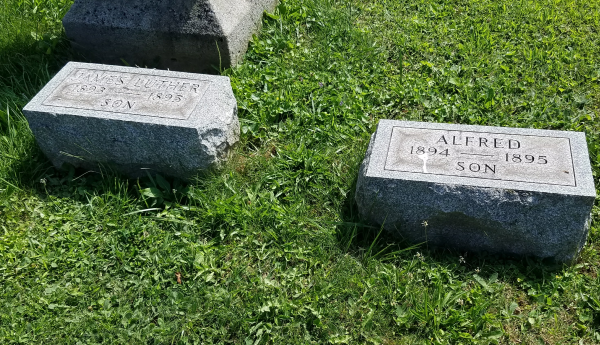 My great grandfather’s first wife died from septicemia, also known as “blood poisoning,” caused by appendicitis. He’d been widowed a second time when he married my great-grandmother, whose first husband also died from complications of appendicitis. Of course, surgical treatment for appendicitis has improved over the past century. In addition, we have antibiotics to treat and prevent septicemia. In fact, some studies show that antibiotics alone can treat the disorder without surgery. My great-grandfather, the same one mentioned above, suffered from tuberculosis for years and eventually died from its complications in 1945. Also known as “consumption,” tuberculosis has been around for thousands of years. Before effective treatments became available, the disease used to kill two out of three people it infected within five years. Scientists began to develop effective treatments for tuberculosis in the late 1940s and 1950s. Today, it’s unusual to hear about someone who even comes down with this disease, let alone dies from it. Pneumonia kills people to this day, particularly the elderly and infirm. Before antibiotics and other medical advances, though, both older and relatively young folks commonly succumbed to pneumonia. People still die in accidents in today’s world. However, a large number of today’s accidents involve motor vehicles, which only became widely available about 100 years ago. Many of the types of fatal accidents our ancestors experienced are a lot less likely today, particularly workplace injuries. Before there were laws to protect workers, many jobs were extremely dangerous in ways we can’t even imagine. I’ve found someone who died in a coal mining accident at age 25. An ancestor who was working on the railroad fell in front of a train. Household accidents were also more deadly. One of my 2x great-grandmothers died from injuries sustained when her clothing caught fire from a gas stove. According to government statistics, at the beginning of the 1900s, out of every 1000 live births, six to nine U.S. women died from pregnancy-related complications. Approximately 100 out of 1000 infants died before reaching the age of one. In some locales, that number was as high as 30 percent. By the end of the 20th century, maternal deaths had decreased by more than 99 percent to less than 8 per 100,000 live births. The infant mortality rate has also gone down dramatically. Improved prenatal, labor and delivery care helped drive down the maternal death rate. Infant deaths decreased due to a combination of efforts, such as milk pasteurization, safer drinking water, and improved sewage disposal. In addition, government programs helped improve the nutritional status of mothers and babies. Birth control options helped women space out their babies. 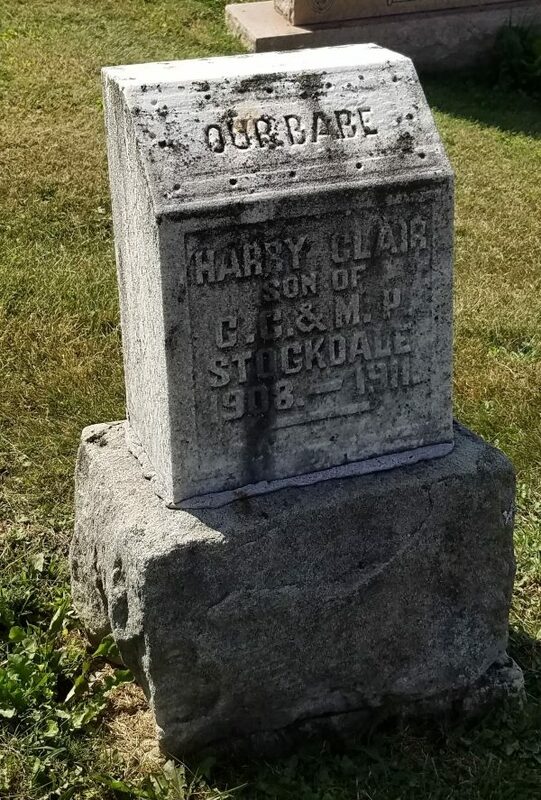 My great-grandfather mentioned above who outlived two wives lost his second wife during the influenza outbreak of 1918-1920. She was neither very young nor elderly – about 40 years old. Many experts considered this flu epidemic, called “Spanish Flu,” to be the last big plague, possibly killing 50 million people worldwide between 1918 and 1920. Other large outbreaks included diseases like typhoid and scarlet fever, which are treated these days with antibiotics. Illnesses like polio, measles, diphtheria, smallpox, and yellow fever can now be prevented with vaccines. Yes, some people lived to fairly decent ages, even before modern advances in medicine. I regularly find relatives who lived to their 70s, and living past 80 wasn’t terribly rare. The elderly tended to die from the same diseases we currently associate with old age. These include strokes, cancer, and heart disease. Cancer was almost always a death sentence at any age up until fairly recently.